The story of Incarnate Word Academy is integral to the story of the Sisters of the Incarnate Word. With the help of the Cleveland Catholic Diocese, the Sisters pur chased the Miller Estate in Parma Heights in 1930. Having come to the Diocese of Cleveland on Mother’s Day, May 8, 1927, where they immediately began to respond to needs in various schools and parishes, they moved to the property at 6618 Pearl Road, Parma Heights, Ohio, on March 4, 1930. The surrounding neighborhood was undeveloped and most of the rural area was just beginning to form into the new City of Parma Heights. The community attracted new members immediately; but on January 26, 1935 the growing community suffered a tragic setback. A fire destroyed their first home. The Sisters of Charity of St. Augustine along with the people of the area, came together to assist the Sisters. The Sisters of Charity provided temporary housing, and the laity began fundraising to provide financial assistance. In the rebuilding process, the laity formed the Incarnate Word Guild, and requested that a school replace the original home. Bishop Joseph Schrembs gave permission, and the building was restored as Incarnate Word Academy. A September 9, 1935 issue of the Plain Dealer commented that: Incarnate Word Academy is a re-building of the former motherhouse, destroyed by a fire last January. It contains ten classrooms, with accommodations for one hundred children. Makeshift classrooms were extended to another original building on the property, lovingly called the Red Barn. On September 11, 1935, with Sr. Bernard Begany as the first Principal, Incarnate Word Academy opened its doors for the first time to an enrollment of thirty-three students. The first graduating class of 1936 had five students, four boys and one girl. The increased enrollment of sixty students the following year necessitated the purchase of a school bus. While the school grew, the Sisters travelled back-and-forth to a temporary home on St. Claire Ave. where they had taken up residence following the fire. In 1940, Sr. Gabriel O’Regan became the Principal of Incarnate Word Academy. During that year, the Sisters built a new home for the congregation. They also saw a need to provide a home-away-from-home for students from families of Incarnate Word Academy who traveled far distances to attend school, and responded by adding a wing to their home as residence for female students. Boarding school life added its own educational and social dimensions to the lives of both the students and the religious congregation. Providing young people with an academically superior education, in an extended family atmosphere, was an important element of the mission of Incarnate Word Academy. This has been true even since the boarding school was closed in 1954. Housing developments flourished in Parma Heights and in other suburbs to the west of the City of Cleveland in the 1950’s and 60’s. The Catholic population also grew rapidly, and many Catholic families sought out Catholic education for their children. Parishes and schools sprung up to meet this need, and Incarnate Word Academy’s enrollment grew steadily. As the congregation welcomed many new members, and the original school building and the Red Barn began bursting at the seams, a new home for the Sisters, and more classrooms became a necessity. The building that is now home for the Sisters of the Incarnate Word, and Incarnate Word Academy, was built in 1952, and dedicated on October 4, 1952. Within ten years, the student enrollment called for yet another addition of classrooms, and so, in 1961 a hall for primary grades was added. Sr. Sebastian Sunderland was the Principal of Incarnate Word Academy from 1952 to 1958, followed by Sr. Bernadette (Agnes) Kane from 1958 to 1964. Th e Red Barn was the site for many extra curricular activities where Sisters, parents and students shared life and community. By 1967, this landmark was replaced with a new multi-purpose building, Saint Joseph Hall. 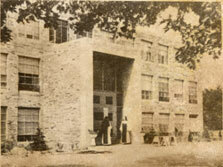 The addition of Saint Joseph Hall allowed for the introduction and expansion of many school programs including: music, sports, physical education and school gatherings that accommodated the entire student body. The Incarnate Word Guild also had a place to enjoy their children’s activities, and to gather for spiritual, social, and fundraising events. In 1977, Incarnate Word Academy, like the surrounding schools, experienced a gas crisis in the middle of one of Cleveland’s coldest winters. The Father’s Club came to the rescue, and within a few weeks, an oil tank was in place to heat the main building. Since Columbia Gas was not restoring gas to the schools in the area for several months, Incarnate Word Academy shared their building with St. Bridget Parish School. Incarnate Word Academy used the building from 8:00 a.m. to 1:00 p.m., while St. Bridget held classes from 1:30 p.m. to 6:00 p.m. This arrangement lasted for six weeks. During the summer of 1977 an elevator was added to the main building. During the decade of the1980’s, under the direction of Principal Sr. Carol Tobler, the curriculum was enriched with foreign languages, science fairs, advanced math, and math competitions. Choir, orchestra, band, and many sports programs were added, which challenged and nurtured children’s opportunities to use the gifts and talents given to them by God. Enrollment reached close to 700 students. And at the same time, the increased use of media and technology in all areas of education required additional space for new equipment. In 1985, a second floor was added above the primary hall wing, to include larger classrooms for Junior High grades, a science lab, a computer center, and media center. In the early 1980’s, Sisters could no longer provide full staffing for the growing student body. Mrs. Abraham, the first lay teacher, was hired to work alongside the Sisters to insure that the tradition of a high quality of faith formation and academic education would continue. In 1987, the school had only three full time lay teachers with the rest of the school staffed by the Sisters. Today, Incarnate Word Academy has three full time Sisters on the faculty and eight Sisters working part time on the faculty and staff. The rest of the faculty and staff are laity. In 1986, the Extended Day Program was begun in response to working parents’ need for safe after-school care for their children. Children, who remain at Incarnate Word Academy until their parents can pick them up after work, have a guided program until 6:00 p.m. on school days. Sr. Eileen Fitzgerald was the Principal of Incarnate Word Academy for 19 years, serving from 1987 – 2006. She held the position of Principal longer than any other Sister in the school’s history. During this time, many changes occurred at Incarnate Word Academy. Additional parking was added to accommodate the number of lay faculty and staff, as well as a new entrance to the building and second floor air conditioning. 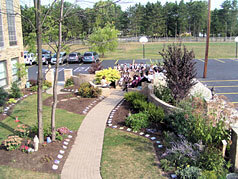 The Learning Garden was built in 2006 and has become yet another place for students to learn and grow. The school kept pace with the ever-changing world of technology during this time as well. The library was computerized, SmartBoards were added to every classroom, and the computer lab was updated. The school also enhanced its outstanding curriculum with academic clubs for Science, Math, Spanish, Latin and Drama. Incarnate Word Academy students have participated and excelled in local and national competitions in writing, spelling, speech, science, math, and music, and have always returned with the highest honors and ribbons. The Saint Joseph Hall trophy cases are filled with evidence of the successes of their sports accomplishments. The story of Incarnate Word Academy would not be complete without the presence of priests who have served as Chaplain, and provided for the sacramental and catechetical needs of the students. Monsignor Joseph T. Moriarty served as Chaplain from 1951 to 2000. He was followed by Fr. Kenneth Katricak, OSB, 2000 – 2004; Fr. Christopher Schwartz, OSB, 2004 – 2006; the return of Fr. Kenneth Katricak, OSB, 2006 – 2007; and Fr. Carl Ciprian, 2007 to 2012. Currently, area Parish Priests , as well as Priest firomthe Apostles of Jesus provide the sacramental needs for the students. Religious education, central to the unique quality of formation which students receive at Incarnate Word Academy has been enhanced by the opportunity the Priests have provided for students to experience all school Masses, grade level class Masses, Eucharistic Adoration, and the Sacrament of Reconciliation – all on a regular basis. An elementary school, steeped in rich traditions and filled with future promise, Incarnate Word Academy calls its students to learn, to love, and to serve. It holds up before its faculty, staff and students the image of Jesus, the Incarnate Word, as the model of what it means to live as a happy and whole human being. Academic achievement and good sportsmanship are high priorities at Incarnate Word Academy. But there is no goal to be achieved that is greater than that each person who walks through the doors of Incarnate Word Academy, know that they are loved by a gracious and caring God, and that they learn to love with the same love with which they are loved by God. Growing as whole human persons, students are prepared to walk into the future with strong character, a willingness to joyfully share the gifts they have received with others, developed leadership skills, and academic excellence. They are prepared to live the Gospel and to make a difference in the world.